“Perfection is achieved, not when there is nothing more to add, but when there is nothing left to take away”. I heard this quote somewhere a few years ago. I believed it to be true the moment I heard it, but never really did apply it to my life per say. In the past week or so however, I realized that it can apply to almost every aspect of life. Whittled down simply to the idea that the activities you do everyday can be systematically eliminated until only the ones that make you happy and cater to you who you are remain, this quote has immediate sprung relevance. You need to clean out the closet once in a while. I don’t listen to much hard rock. I filled out that niche for myself early in my life and adding any more like-bands to my repertoire would be redundant. If anyone remembers my Fall of Troy post, yes that is one of them. But today I want to talk about the other major one, which creates rock music in a much different fashion. 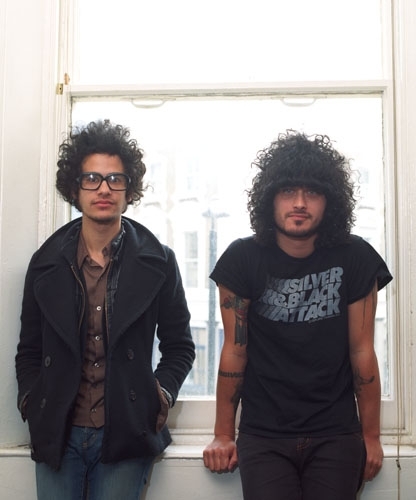 The Mars Volta is a band which has been famed for its beautiful progressive rock. Incorporating influences from krautrock, jazz fusion, Latin American music, and mathrock, their music is melodic, groovy and downright rockin. The band’s lead singer, Cedric Bixler-Zavala, has the most unique and talented voice you will hear. The debut 2003 album, De-Loused in the Comatorium, was the band’s best selling album and earned them critical acclaim. I’ll be bringing it to you today. The song Son et Lumiere creates a short lead into Inertiatic Esp, sort of like the sound of dread at an abandoned train station at night time. The vocals are eerie and distorted, the lyrics nonsensical yet frightening. The short drum build falls into a crash of musical ecstasy, as almost every instrument this band employs can be heard blaring away skillfully. “Now I’m lost” Cedric wails, as the song quickly changes displaying the technical side of the math-rock influence. It switches back and forth, not losing a beat… that is until the verses melt away at about 2 minutes. This music takes heavy influences from past bands like Pink Floyd in employing a level of pure trippyness. The psychotic guitar lines are from none other than Omar Rodriguez-Lopez, and display a level of musical creativity unparalleled by anyone. The song ends on a very creepy almost theatrical sounding note. But this is only the first song on the album. Cicatriz ESP is a 12 beast and my favorite song on the album. This song starts with beautiful melody. The lyrics are in my opinion random one liners which are strung together to create maximum confusion upon listeners. “We’ll drag your halo through the mud, ash of Pompeii. Erupting in a statue’s dust, shrouded in veils. Because these handcuffs hurt too much.” The drum line is repetitive yet completely amazing. The song seems to float along like a river of honey, stopping once in a while to pick up the tension and remind you that this is still rock. 3:50 is my favorite part. The song just disassembles into a sort of pure bliss. The guitar and piano just create the grooviest jazz atmosphere I have ever heard. Like psychedelic lounge music it lulls you away from this planet as it then itself falls apart into nothing. This Pink Floyd esque nothingness has the sounds of creatures emulated by guitars and slowly builds back into a downright epic return of the main verse. Truly amazing in my opinion. Televators is arguably the trippiest and most psychedelic song on this album. The beginning has the sounds of tropical jungle animals but is slowly overrun by this strange miasma and a classical guitar. “Just as he hit the ground, they lowered a tow that stuck in his neck to his gills”. This is the one song on the album where Cedric’s vocals stay relatively relaxed all throughout. The song is slow and chill, like sailing down a river somewhere in the Amazon, yet retains a certain level of creeping dread reminding you of any dangers that can befall you. De-loused in the Comatorium is a masterpiece in every sense. Every song on this album can stand entirely on its own, yet as a whole it creates a story. The album actually tells a story of a friend of the band. Nicknamed “Cerpin Taxt”, a poet and an artist, he overdosed purposely on drugs and fell into a coma for several years. Upon waking up he committed suicide a few weeks later. The way they tied the tragic story in while maintaining the beauty just speaks of their insurmountable skill. The Mars Volta has released 4 albums since this first one, each one maintaining the same level of artistic skill as the previous. I will most surely return to them at some point in time. In the meantime be sure to mentally make room for them by removing similar but sub-par bands. P.S. Oh and here is the last song on the album Take the veil, Cerpin Taxt. Beware. The part starting right before 4 minutes might put you in a coma.